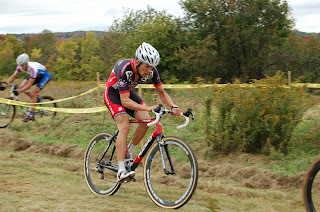 This Saturday was the "hometown" race at Pineland Farms in New Gloucester Maine. Hosted by the Maine Cycling Club, this is one of my favorite venues. 30+K of grass xc ski trails and open fields. The course set was moderately technical, but very "heavy" with a good bit of elevation and long grass. Sat was the first real "fall" day in Maine : frost on the grass and cars, the warm up would require some "Belgian knee warmers", along with thermal gloves and jacket. After 3 laps, I am 10sec up on big AL and Wheels, thinking I would see 3 to go, I would keep pushing on...then I saw 4 to go. So I drifted back, let them catch me, then sat on. Al was setting a nice comfortable pace, then a stick in the spokes and he lost his momentum...so I attacked. Wheels came with, and we were off. 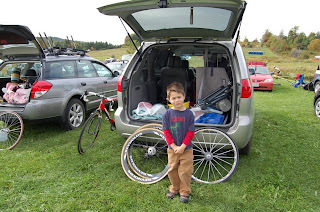 I could hurt Wheels on the steep, and harder sections, then he would roll back to me on the tech sections. I had plans to drill it up the climb to the finish, but Wheels and I called a truce and decided to split the cash. So we cruised in, hand-in-hand. Of course he rolled across JUST in front of me, and got the credit for the win. All in all a FUN race, on a gorgeous day. Post race, I got my cash, then spent it on lunch with the fam at the Pinelands cafe. 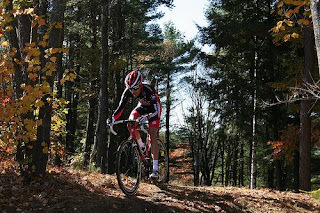 If you saw my 10/8 post, you know I have mixed feelings about racing in Gloucester MA for the traditional UCI CX weekend. I have never really been "in" the races down there. Usually illness or poor starts conspire against me. For 2008, I thought the trend would continue with an early week "bug" hanging around till Thursday. I hit it hard with all the homeopathic remedies I know...and maybe they worked, or at least my brain thought they did! Sat Elite Masters 1/2/3 Race: I got a front row call up, and nailed the whistle pretty good, to slot into third behind Johnny B. and Curtis B. Through the twisty's and into the run-up, I drop back a few more slots. The legs are good, but not great. I settle in a group with Roger A. and a few Corner Cycle guys (including Kevin H.). I am making a few mistakes in the corners, and having to close back up. Then Roger attacks, and the rubber band is snapped. I drop to a group with John M. and a few Westwood dudes. I basically sit on, and let them duke it out...with 1 lap to go I am hurting and they gap me a bit. Coleman Oconnor goes by...and I drop to 11th. I would finish solo there. Full recovery post race. Recoverite, dry clothes, compression tights, and calories. straight home for some family time and R&R. Sun Elite Masters 1/2/3 Race: similar call up today. This time I NAIL the whistle, clip in like greased lightning (did I mention I love M970 Shimano Pedals?) and hole shot to the dirt. This was key, as they added a steep runup into the first 2 min of the course. I hit this in 3rd or 4th (Mark Mc. and Johnny B. lead). I surf this second group (Roger A, Mark S, Dan C) then let a gap go in the twisty's and get caught by the same group as Sat. I have good legs today, but the teams (corner cycle and westwood velo) are controlling so I just sit on the back. With a lap to go, I should have punched it up the road to lead into the runup as I am fastest of the group here, but I dont. Then, on the next barrier section, I kick the pedal while in the big:big combo, and the chain drops...DOH! With 2 min to race, I am trying to pedal the chain back on, it jumps up quick, but the gap is 20 bike lengths. I charge HARD down the backstretch near the ocean, and just as I catch on the 4 guys start drilling it...I am gassed. I cant respond and roll in for 10th. All in all, I will take these results. I scored Verge points at both days, and maybe even moved up 1 spot. I am healthy, and the courses get better for me (Noho and Sterling). 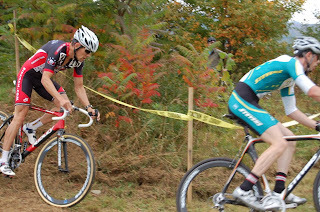 I don't have any photos this week, but check http://www.cyclocrossphoto.com/ for a bunch of great shots of the event. This weekend : hometown race at Pineland, then Canton! 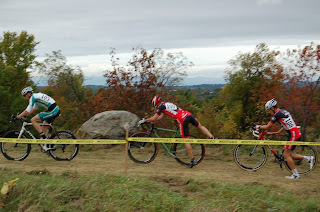 there were other races this past weekend, besides Gloucester New England worlds! 3 PBMC Athletes toed the line at IM Hawaii World Championships. Mother natured returned this year with strong winds and heat, the first time in 4 years or so. Alex Mc., Blake B. and David L. all dug deep and got it done. congrats to you all! Love : the super bowl of CX in the Northeast, great local, close to home. and for 2008...the cold that my 3 little ones has is creepy in. I know I will be good for Gloucester 2009 though. All sorts of PBMC athletes killing it on the race course!! 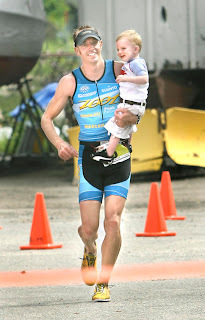 Alex McDonald wins Mooseman AGAIN! Blake Becker wins Rockman HIM! Jessica Broderick gets a bronze medal at AG Worlds! I mean really, this just scratches the surfaces...everybody is coming into great form. The work is paying off and the results will come! Since the Belgie trip I have been pretty lax in my training as I knew these 2 would be here at the start of the race season. I look at it as a new frontier, and a temporary set back. They are both lovely little things, and should bring more joy than I can comprehend. Carter is getting his Like A bike dialed and making a few "hot laps" down the neighbors driveway. I captured a few Thursday, but missed some of the full rides. With his swim lessons and his god given running ability...the kid is a natural. I just found out I share a birthday with the Pope (he is a bit older and wears those cool robes and stuff). My boy AK at SAC sent me some of the PRO parts...these things are super nice, and very popular in Europe. I plan to use the bars/stem/post on my cross rigs for 2008, but for now these bad boys are going on the TT bike....yummy.